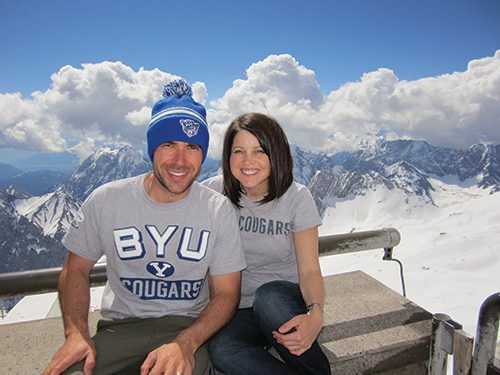 Bad weather prevented Zachary W. (BA ’03) and Alicia Kaelin Derr (BM ’01) from hiking the Alps on their honeymoon. Six years later they returned to visit his missionary parents and celebrate their Cougar pride from Zugspitze, the highest mountain in Germany. Where have you witnessed Y spirit? In outer space? In a sea of Ute fans? Send us a photo. If we publish it, we’ll pay you $50. Send photos (at least 5 by 7 inches and 300 dpi) to magazine@byu.edu.